In the late ’60s, Bob Edson perfected his recipe for an all purpose sauce that he shared with family and friends. By 1982, Bob Edson formed an equal ownership corporation with Terry Edson, Al Malekovic, and Reed Malekovic. Today Country Bob’s has an automated bottling line and distributes products across the nation. In addition to Country Bob’s All Purpose Sauce, there is also a BBQ Sauce, Seasoning Salt, Apple Chipotle, and Honey Habanero All Purpose Sauce. We received Country Bob’s All Purpose Sauce for the purpose of a review. On Saturday evening, we had some friends over and we passed the Country Bob’s All Purpose Sauce around for everyone to try. It complimented our meatloaf well and everyone seemed to enjoy its taste. We all agreed that it would taste good with burgers, too. On Sunday evening, we used it again with our leftovers. (Matt used a small portion of sauce while I slathered it on my meatloaf!) I told Matt this evening that we might need to buy Country Bob’s by the case because he has been trying it on a variety of foods including french fries. It enhances the taste of foods rather than overpowering them. It has a slightly sweet taste to it – most likely from the molasses. The sauce is not too thick, but just thick enough that you can dip food into it. If you would like to find out where you can purchase products by Country Bob’s, you can visit the locations section on their website. Here in Virginia, you can find their products at most Wal-marts. Country Bob’s is also giving two bottles of Country Bob’s All Purpose Sauce to 2 readers of Our Virginia Home. You can enter using the Rafflecopter form below. The giveaway will be from 12:01AM June 13th to 11:59PM June 25th, 2012. 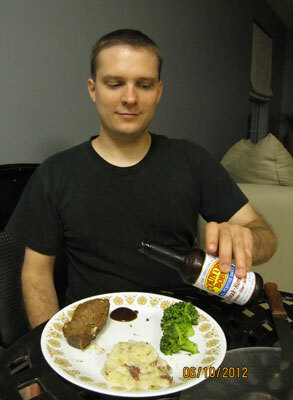 We received two bottles of Country Bob’s All Purpose Sauce for the purpose of a review. However, only our honest opinions were expressed. I would probably use it on grilled steaks or pork chops. Thanks for the giveaway. Love Country Bobs sauce. Just reread the question. I’d definitely use it to make the Rosemary Pork Roast at http://www.countrybobs.com/recipes/item/viewall/id/62. I think this might be perfect for my pork chops! Their recipe for BBQ Submarines would be great for 4th of July! I’d like to try the Hawaiian Pork Chops. I would try the Shepherds Pie…yummy! Sounds good!! I would love to try it!!! I would try the Cheese Log. I plan on making the Slow Cooker Barbeque Ribs w/some Country Bob’s! I would like to make the country bobs shrimp and scallop kabobns! I would make Ranch Style Beans. They all look yummy! I think I’d pick the Fabulous Football Dip.